lovely colours and patterns, originally uploaded by indiaeden. Sid and I are stuck at home all this week since he came out in chickenpox last night. We are allowed out for school runs,but almost all our other activities have been cancelled. Thankfully so far, he seems mostly unbothered by his itchy spots, fingers crossed he stays that way. The wallpaper and the screen are apparently 1930's repro,updated a little. 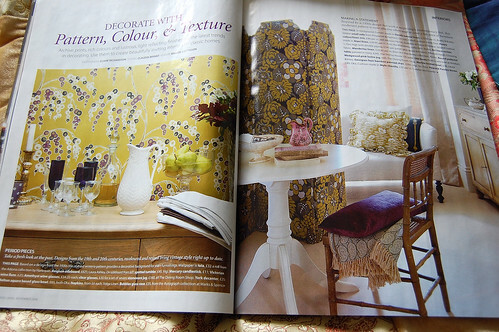 I do find myself drawn to 1930's styles lately,but it's the combination of mustard and purple that really caught my eye in the wallpaper. I've recently been using a lot of mustard,purple and green in various projects,and have even bought a mustard cardy,and my lovely mustard yellow shoes all in the past week. I remember years ago as a student visiting a colour forcaster, she prepared colour charts for the fashion industry,sometimes years ahead.I was astonished as a young student to discover this was an actual job,I still find it pretty mind boggling to be honest,and even more mind boggling when I realise that despite not being particularly fashion concious or even very media concious I still am somehow drawn into this colour "master plan" y'know? Still looks like my colours for this autumn are mustard,purple and green (with a bit of brown thrown in) Not too terribly far from this. Oh and this is interesting too. I think that mustard and purple go well together, my wedding theme was old gold and purple, 11 years ago now! Sid's a bit grumpy and clingy,but not too bad,thankfully. I keep checking your blog Jenga, isn't your baby due soon? LOL, It is rather weird that we've never actually met irl.